Is there anything better on a cold winter night than a creamy frozen dessert?... probably, but at least they don't melt as quickly as they do during the summer. Recently I picked up an ice cream machine (the sort with a frozen core that you keep in the freezer until you are ready to churn) so I've been playing around with making ice cream and frozen yogurt last last few weeks. 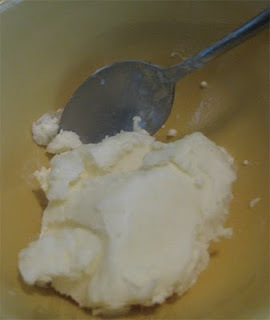 I've made some excellent ice cream, but frozen yogurt seemed like a better fit for a blog about fermentation. For the first batch of frozen yogurt I tried to just mix sugar and yogurt and churn it. This method produced a frozen yogurt that was alright right out of the churn, but after a night in the freezer it froze rock solid. The reason was that it had too much water for the fat and sugar present to prevent the formation of large ice crystals. My solution was to remove most of the whey (inspired by a recipe from Good Eats). I drained 1 qrt of plain yogurt for four hours in a colander lined with cheese cloth set in a large bowl. 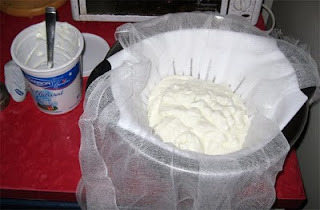 To speed up the draining process I folded the cheesecloth over the yogurt and placed a small pot with a can in it on top. After that time I was left with about 2.5 cups of yogurt with the remaining watery liquid drained into the bowl. I took the thick yogurt and mixed it with 1 cup of plain white sugar. Because the yogurt had been sitting in the refrigerator as it drained it was ready to churn (the colder something is before you start churning it the smaller the ice crystals it will form and thus the smoother the results will be.) 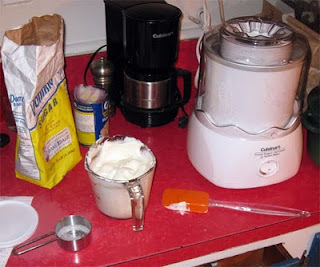 The churning was complete within 15 minutes, with the frogurt just about the consistency as commercial frozen yogurt. At this temperature the frozen yogurt was great, really creamy with the right level of sweetness for me and plenty of tanginess. Warmer temperatures are used to serve both frozen yogurt and soft-serve ice cream because they are lower in fat than regular ice cream. After a night in the freezer the froyo was a bit firmer than ideal, but it was not icy or unpleasant. The consistency softens considerably if you allow it to warm up for 10 minutes before eating (which can be more difficult than it sounds). Just like ice cream you could add some flavor with vanilla or preserves (subbed for the same volume of sugar) before churning, or any chips or chunks you want during churning. You can also top it with fresh fruit, weird breakfast cereal, or standard ice cream toppings. Me? I've been eating it plain because I enjoy the lactic tang. Hopefully I'll do a batch of frozen yogurt soon with homemade yogurt if I get my yogurt-making-act together. Hopefully everyone has been enjoying the onslaught of posts this week as a results of my snow related time off work. I've been brewing, bottling, and cooking more than usual to kill time in between shoveling. I have previously made a few batches of beer sorbet...I bet that would be right up your alley. 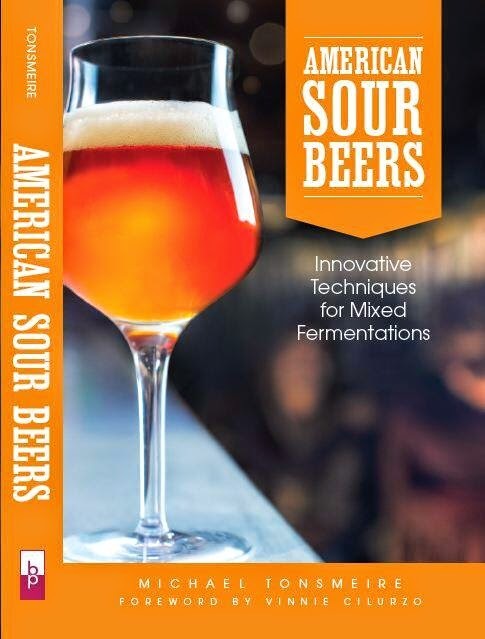 I did this both with a Belgian Wit and also an American Brown. Warmed up some water, added sugar and gelatin, let cool, mixed with beer, and into the ice cream maker. Both came out amazing...you may want to try it. Sounds excellent, I will have to give that a try. How much sugar?